Am frühen Nachmittag des 26. Juni 2014 habe ich mein Büro nach kurzer Abwesenheit wieder betreten. Meine Kollegin hatte sich eine Sonnenbrille aufgesetzt, lehnte entspannt in ihrem Bürostuhl und schaute konzentriert aus dem Fenster unseres Büros im zweiten Obergeschoss. Da draußen wäre was am Himmel, sagte sie mir auf meine erstaunte Nachfrage. Ein Blick aus dem Fenster zeigte ein von mir bis dato nie gesehenes atmosphärisches Phänomen. Eine Zirruswolke stand in intensiver Helligkeit und in den schönsten Spektralfarben, oben rot und unten blau, knapp über dem Horizont am Himmel. Mir war sofort klar, dass es sich um einen Effekt der Lichtbrechung an Eiskristallen handeln musste. Um welchen Effekt, da musste ich erst nachlesen. Ich kann am Himmel nicht alles kennen, vor allem, wenn mir es noch nie begegnet ist. Aus Zeitgründen bin ich erst heute dazu gekommen, zu recherchieren, um was es sich hier handelte. Eine gute Anlaufstelle ist hier die Seite von meteoros.de und, nachdem ich eine Weile gesucht habe, dort der Artikel zum Zirkumhorizontalbogen. Die Erscheinung ist demnach in Mitteleuropa relativ selten, was erklärt, dass ich sowas noch nie gesehen habe, obwohl mein Blick häufiger in den Himmel gerichtet ist, als der meiner Mitmenschen. Das Bild entstand übrigens um 13:12 Uhr. Wenn man unsere mitteleuropäische Sommerzeit berücksichtig, war das ziemlich genau um die wahre Mittagszeit, also zu fast idealen Bedingungen für die Beobachtung eines Zirkumhorizontalbogens. Diese ist auf der geographischen Breite von Stuttgart nur zwischen etwa vier Wochen vor und vier Wochen nach der Sommersonnenwende möglich. Fairerweise muss ich darauf hinweisen, dass ich das Bild für die Präsentation bearbeitet habe. Da aus meinem Telefon nur JPEGs raus kommen und dieses Format bei der Bildbearbeitung immer Informationen verliert, musste ich recht vorsichtig vorgehen. Zunächst habe ich die Schatten etwas angehoben und die Lichter geringfügig zurück genommen. Danach habe ich den Kontrast allgemein etwas verstärkt und eine Routine zur Kantenschärfung verwendet. Zum Schluss wurden noch hässliche Ränder weg geschnitten und das Bild auf 1920 x 1080 skaliert. Zirkumhorizontalbogen am 26. Juni 2014, aufgenommen um 13:12 Uhr. Ein Mausklick auf das Bild vergrößert es. Actually, I didn’t expect to upload a photo from a smartphone here. But the DSLR is usually not there in the office. So I had to use my phone for a documentary photo. In the early afternoon of 26 June 2014 I entered my office again after a short absence. My colleague had put on sunglasses, leaned relaxed in her office chair and looked out of the window of our office on the second floor. There was something out there in the sky, she told me in response to my astonished question. A look out of the window showed an atmospheric phenomenon I had never seen before. A cirrus cloud stood in intense brightness and in the most beautiful spectral colours, red at the top and blue at the bottom, just above the horizon in the sky. It was immediately clear to me that it had to be an effect of the refraction of light at ice crystals. What effect, I had to read about first. I can’t know everything in the sky, especially if I’ve never met it before. Due to lack of time, it was only today that I came to research what this was all about. A good place to go is the site of meteoros.de and, after searching for a while, the article about the circumhorizontal arc. The appearance is accordingly relatively rare in Central Europe, which explains that I have never seen anything like this before, although my gaze is directed more frequently into the sky than that of my fellow humans. By the way, the picture was taken at 13:12. If one considers our Central European summer time, it was really pretty much around real noon, almost ideal conditions for observing a circumhorizontal arc. 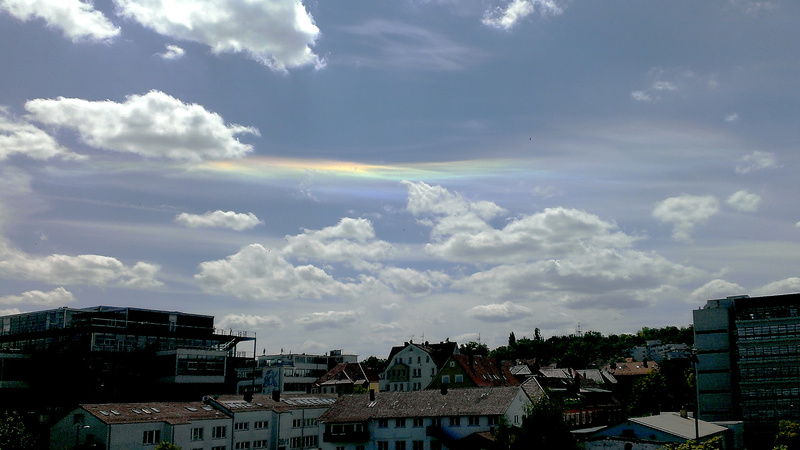 On the geographical latitude of Stuttgart, this is only possible between about four weeks before and four weeks after the summer solstice. To be fair, I must point out that I have edited the image for this presentation. Since only JPEGs come out of my phone and this format always loses information during image editing, I had to be very careful. First I raised the shadows a little and took the lights back a little. Then I increased the contrast a bit and used a routine to sharpen the edges. Finally, some ugly edges were cut away and the image was scaled to 1920 x 1080.